Harshni Raghav got this spectacular shot of the Harvest Moon on September 12, 2011, somewhere in the Golden State, California. The Harvest Moon will float just above the planet Uranus in the sky this weekend, and skywatchers can get a great look at the celestial show without even going outside. The online Slooh Space Camera will webcast live observatory views of Uranus and the most famous full moon of the year Saturday (Sept. 29). One show begins at 7 p.m. EDT (2300 GMT), and another follows three hours later; viewers can watch the free broadcast on their computers or mobile devices at Slooh.com. A panel of experts will be on hand during both webcasts to discuss the Harvest Moon (the name given to the full moon that occurs closest to the start of autumn), Uranus and just what Slooh's feed is showing. These panelists include Bob Berman, contributing editor and monthly columnist at Astronomy magazine; Slooh observatory engineer Paul Cox; and Slooh president Patrick Paolucci. Near-infrared views of Uranus reveal its otherwise faint ring system, highlighting the extent to which the planet is tilted. Uranus' atmosphere is dominated primarily by hydrogen and helium, with a small amount of methane that gives the "ice giant" its bluish-green tint. The planet has a ring system and 27 known moons. It's also tilted so far that it essentially orbits the sun on its side; researchers think the planet may have been knocked askew by a collision with another large body long ago. If skywatchers wish to see Uranus through their own telescopes Saturday night, they should scan just below the moon and look for the only green "star" in the field of view, Slooh officials said. 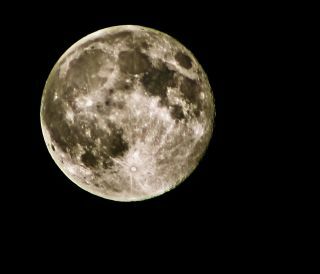 The Harvest Moon is the full moon that occurs closest to the September equinox, which marks the beginning of autumn in the Northern Hemisphere and spring in the South. Farmers have historically worked late into the evening by the light of this moon during the peak of harvest time. Around the time of most full moons, moonrise occurs about 50 minutes later each successive night. But that figure is greatly reduced around Harvest Moon time, to 25 to 30 minutes in most parts of the United States. “The Harvest Moon is widely misunderstood," Berman said in a statement. "Its behavior is unique, and yet its appearance is no different from any other full moon. That will be one major focus of Saturday night's live coverage." "As for Uranus," he added, "with its singular green color and wild axial tilt, its permanent overcast never allows us to see markings of any kind, and yet its story is nothing short of fascinating." Editor's note: If you snap an amazing photo of Uranus or September's Harvest Full Moon that you'd like to share for a possible story or image gallery, please contact managing editor Tariq Malik at tmalik@space.com.